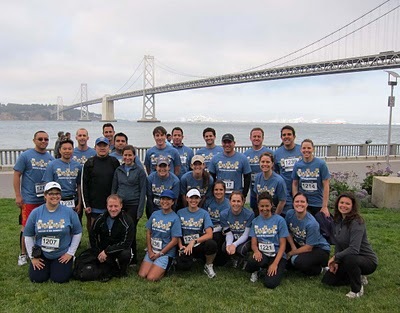 A few weeks ago, I participated in JP Morgan Chase's corporate challenge. It was a 3.5 mile challenge that took us down the Embarcadero and around the ballpark. I meant to write about it then, but...you know me, I forget! It came back to mind because I was talking about it to one of my friends last night about it, and she was mad at me that I did so well. Hee. (sorry, Lis, couldn't resist). And do well I did! I started out running with a few coworkers, but they were a little too fast for me. Turns out, I was a little too fast for a few others. So I ran solo, which can be tough sometimes when you're trying to push yourself. I knew I was going at a fast clip, but felt like I was in the back of the pack. As I turned the corner to finish up on the pier, I tried to sprint but I had really nothing left. It's no wonder...I had finished the race with an 8.56/mile average. Under 9 minutes a mile. In the immortal words of Joey Russo...WHOA!